Water utilities and the communities they service face supply pressures from rapid population growth, climate change and demands for affordable services. 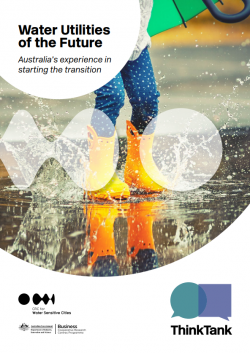 This paper by the CRC for Water Sensitive Cities', the first of its Think Tank pieces, presents Australian examples where water utilities are playing a leadership role in broader city planning through advocacy, whole-of- system perspective, technical excellence, and investment in community engagement and industry capability. These Australian examples address global challenges relevant for international as well as Australian utilities. As implemented exemplars, these case studies serve to motivate utilities to start taking action - no matter how small - in positioning and transitioning to utilities of the future.